The Seabulk Transfer Vessel (STV) is a unique development to handle bulk cargo and operate in open sea conditions. 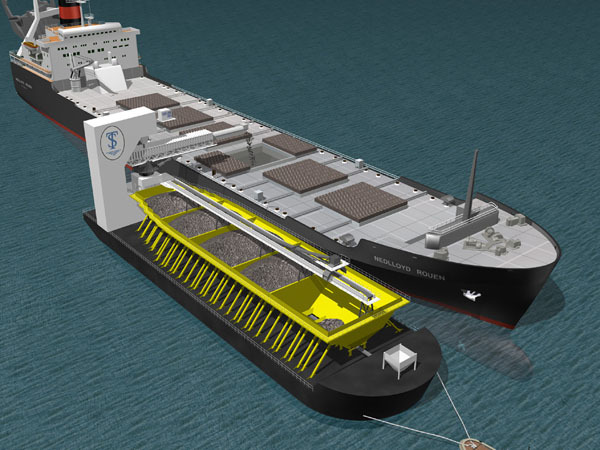 The vessel has an above-deck hopper with a nominal capacity of 7 300 cubic metres and an unloading system capable of discharging cargo at 2 200 cubic metres / hour. The vessel also has the capability to self-load, thereby permitting use of the barge at facilities that have limited barge-loading capability. With the large boom slewing range it is possible to use the boom aft to transfer bulk cargos from a ship loader to a ship in deeper water. Class Notation: ABS & A1, un-manned barge for ocean service. The barge is to be configured in accordance with the preliminary General Arrangement. The barge will have a single main deck, straight stem, semi-cylindrical bow and open (without hatches). There will be a small focsle forward, and the unloading boom, elevator casing, machinery spaces and control room will be aft. The barge will feature hoppered holds, side water ballast tanks, an unloading tunnel and a void double-bottom below the unloading tunnel. There will be a forepeak, and various ballast, void. Fuel will be carried in storage and service tanks aft. Barge may have a void double bottom. Barge and all components and machinery installed shall conform to Transport Canada's "Ship Electrical Standards" - TP 127 or equal. Barge and all components and machinery installed shall conform to the IEEE 45 Standard for Electrical Installation on Shipboard. Damage stability and SOLAS watertight subdivision of tunnel not required. Good quality marine epoxy and corrosive paint system on all steel work. In general, the self-unloading system will comprise bulk flow gates to be arranged over a single tunnel conveyor, a single elevator and a boom mounted discharge conveyor. The single tunnel conveyor will run continuously - the cargo being carried between the continuous tunnel conveyor and the C-Loop as the means of elevation. The boom structure, associated hoist and slew systems and associated conveyor will be as per this preliminary specification. The primary cargoes are stone/sand and gypsum. The continuous unloading rate is to be 3 000 MT/hr for stone/sand (1.5 t/m3) and maximum lump size 100 mm. The barge will have hoppered holds inclined at 40 degrees. Slewing shuttle-boom to be covered and fitted with fog nozzle water-spray system at both ends. Water spray system able to operate from barge or shore water supply. Elevating system and unloading boom to be located aft. An elevated tripper stacking conveyor (self-load). The unloading and ballast systems to be operated from the control room, air-conditioned, with good visibility of the boom-head while discharging. Tunnel gates and vibrators to be able to be operated both remotely from the control room and locally by personnel stationed in the tunnel if desired. Dredge/slurry pumps to be fitted in wells forward and aft in the cargo tunnel, discharging into holding tanks for cargo residues. One (1) boom: length of 21 metre + 14 metre shuttle, slewing 270 degrees to port and starboard, luffing range of +7, -15 degrees. All conveyors to be designed to operate in up to two (2) degrees trim and two (2) degrees heel. All conveyors to be fitted with emergency stop cords on both sides and safety guards mounted to each pulley. Belt scrapers to be fitted on each conveyor belt head pulley. System components in the tunnel will be subjected to frequent high-pressure hose wash down. For this reason it is imperative that all equipment be designed, selected and protected for excessively wet and corrosive conditions. Air: -20C and Zero Relative Humidity to +35C and 100% R.H.